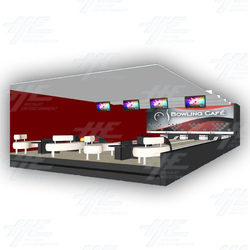 The Bowling Cafe Lanes in Standard Length delivers all the excitement of the official tracks and is the perfect size to fit a more diverse range of locations, including smaller facilities, but those that still want a larger focus on the bowling system. These bowling systems attract all ages and fits into any kind of business. Up to 6 players can play on a single lane at a time in a more casual atmosphere, and the best part is there are no special shoe requirements (although, it is still advisable for players to wear sensible shoes when playing). Features of the Bowling Cafe Lanes include: <b>Easy Controls</b> Coin/Token/Samrtcard terminals central management systen allows players to easily control what they need to using the joystick and buttons. Simply insert credit and play! <b>Overhead LCD Displays</b> Flat screen 32" LCDs display the lanes score and TV or DVD images. When the lanes are closed, operators can show personalised messages - perfect for promotions, messages, and advertising. <b>LED's along the Lane</b> Lighting system with LEDs on the side of the lanes provides several visual effects that complement the Bright Bowling. <b>Bright Bowling</b> The bowling lanes are literally transformed into a show of colours, lights and music. The glow-in-the-dark pigments used on the equipment components, interact with the black lights, resulting in a great glow attraction. <b>Publicity Panels</b> Shown as the pins reset, they are a place of great visibility for all players. Ideal for advertisements. <b>Custom Animations</b> 3D Animations which at each frame, a 3D animation is shown corresponding to the score, providing more fun and interactivity for players. <b>Bowling Lounge Furniture</b> The Bowling Lounge Furniture line is designed to create a lounge atmosphere, providing greater comfort to your customers and maximising the time they spend in your center. These bowling systems attract all ages and fits into any kind of business. Up to 6 players can play on a single lane at a time in a more casual atmosphere, and the best part is there are no special shoe requirements (although, it is still advisable for players to wear sensible shoes when playing). Coin/Token/Samrtcard terminals central management systen allows players to easily control what they need to using the joystick and buttons. Simply insert credit and play! 3D Animations which at each frame, a 3D animation is shown corresponding to the score, providing more fun and interactivity for players. The Bowling Lounge Furniture line is designed to create a lounge atmosphere, providing greater comfort to your customers and maximising the time they spend in your center.